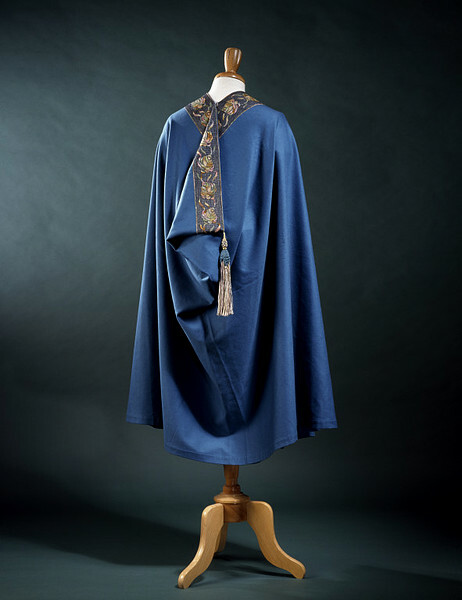 The burnous, both in name and design, is of Arab origin, and describes a full, hooded cloak, often decorated with embroidery and tassels. It can also be spelled burnoose and bournouse. 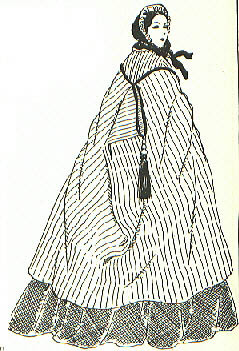 The burnous was introduced to Western fashion through the Spahi, the French calvary troops of from Algeria, Tunisia and Morocco, whose uniforms included burnous. The Spahi began in the 1830s, and saw extensive action throughout the 19th century. 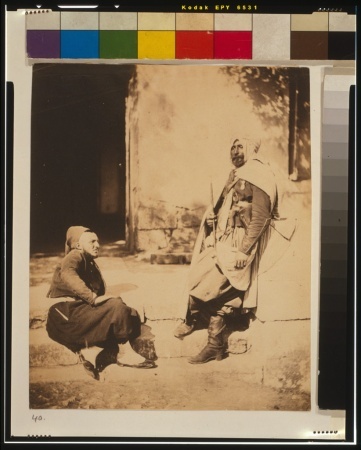 This, combined with photographs of the Spahi troops in their burnous taken by Roger Fenton in the 1850s popularised their image in the West, and started the fashion for the cloaks. 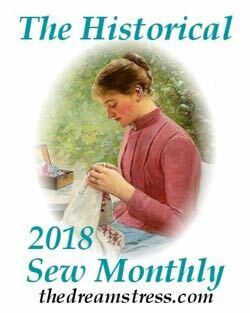 Burnouses fit well with mid-19th century fashion, as the loose shape was easy to wear over large hoopskirts, and the hoods mimicked the bonnets that were worn with daywear, or could even fit over the bonnet. 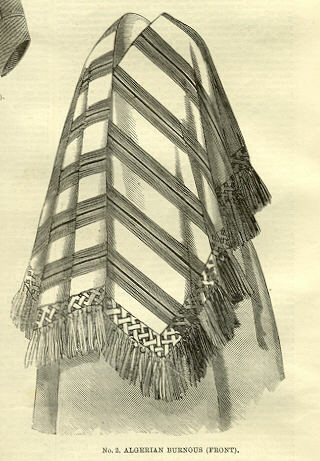 These are made frequently in cachemire, in broad Algérienne stripes, or in light coloured cachemire, wadded and trimmed with plaid, and also in black silk trimmed with plaid, or plain velvet, plaited ribbon and silk, or handsome passementerie. 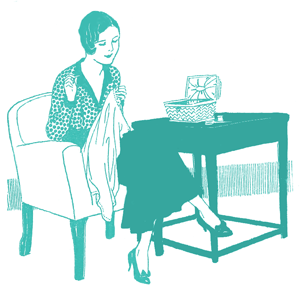 When trimmed with moire the lining should be of the same colour. Throughout its history in Western fashion the burnous retained an exotic flavour, emphasised by the use of Eastern fabrics, the aforementioned “Algérienne stripes”, tassels, and Indian embroidery. The shape did alter with fashions. 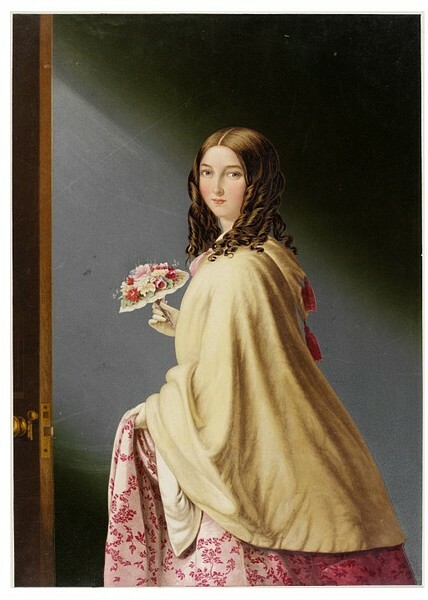 Burnouses became shorter and less voluminous as the hoopskirt went out of fashion and the bustle came in in the 1870s. 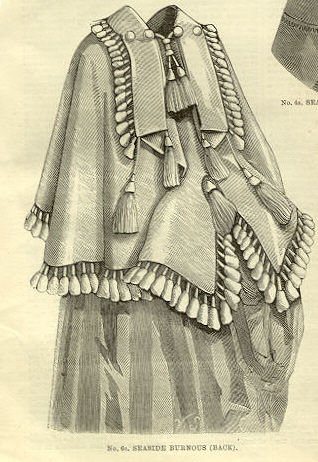 The burnous saw a decline in popularity in the 1880s and 1890s, and the more fitted and structured silhouettes of fashion demanded more structured garments (such as the paletot). It might have fallen out of fashion entirely were it not for the Aesthetic movement and the emphasis in aesthetic dress on ethnic inspiration and looser silhouettes. 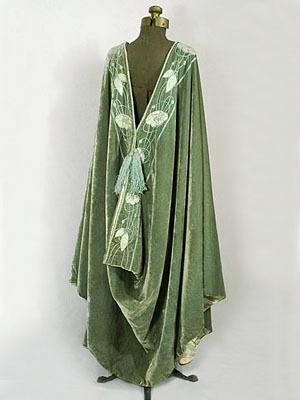 They remained popular in the early 20th century along with the overall fashion for exoticism. 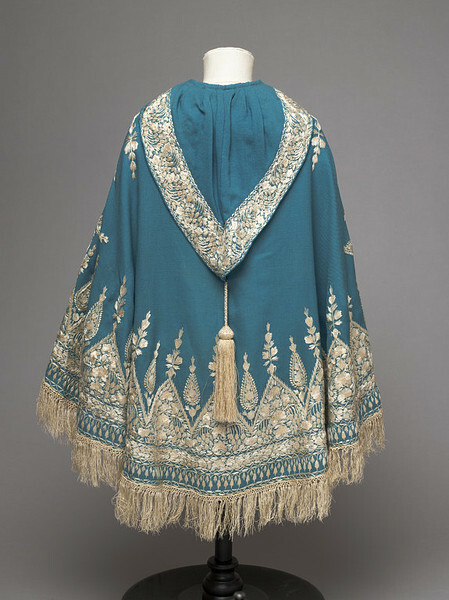 Burnous cloaks were often patterned with ‘Eastern embroidery” to emphasise the exotic effect, though art nouveau inspired designs were also popular. Teehee! I had not noticed the bridesmaid’s front tassel. I wonder if it was to hold the hood down in wind? Or if the hood was never meant to be worn up? Thanks Dreamstress. I’ve always wondered what these were. I like both of the blue ones (the adult one as well as the child’s); they are of beautiful color and have gorgeous trim. But I think the green one at the very bottom of the post has the most seductive lines–and the color’s pretty nice too! Funny, I’m usually a major sucker for green, but that one does nothing for me. I love, love, love the child’s one though (mmmm…paisley!). that shade of green was popular in the Art Noveau palette– it is called “eau de nile” which is suitably exotic. 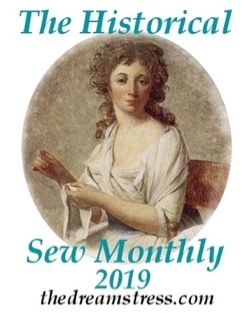 Another popular hue in this era was “ashes of roses” which is a subdued greyed pink for people who usually hate wearing pink– it looks dignified on older women. I want the green one. What a beautiful thing! Excellent article; wonderful selection of pictures. Anyone, know of a pattern? And to wear the hood, did they lift it up and over the head or did they open the neck, move the hood up and then redo the closure? Or did they simply not use the hood…was it purely decoration? I still see these when my Moroccan friends bring back clothing from trips home. 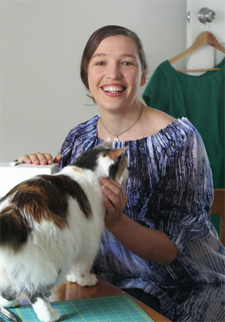 If you can’t find a pattern, you could probably get a cheap one online and use it to draft your own.